Barb and I, and the children - Gillian (15) and Colin (13) - spent last week’s March Break holiday in Florida. It was our family’s first visit to Florida. For Barb and me, one of the main attractions of the place is the interesting birdlife. I was anticipating it greatly. In fact, I went out and bought a new lens for my digital SLR. Usually I use a 18-105 mm zoom lens. To do real justice to the beauty of some of the large wading birds (herons, ibises, pelicans), however, I decided to invest in a zoom lens with a much longer telephoto capacity – a 70-300 mm zoom. (Although, as you may know, using these lenses on digital cameras multiplies the focal lengths by one-and-a-half, so it behaves like a 105-450 mm lens.) I couldn’t wait to try it out on the birds that would appear. So, what follows, is a photographic journal – offered chronologically – of the birds that stood out on this trip to Florida. I photographed some of these birds forty or fifty times – different habitats, different lighting conditions, different times of day. These are all my shots. 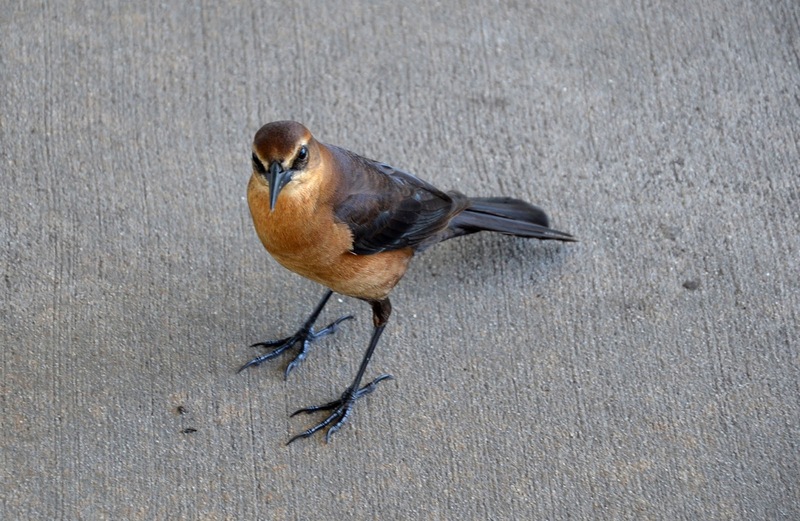 The Boat-Tailed Grackle (Quiscalus major) is a non-glamorous, rather bland kind of bird species. But it's a perfect example of dimorphism in birds. “Dimorphism” means literally ‘two-forms’. And it refers to the distinct differences in the appearance of the male and female species. This first significant species of the vacation (because I hadn’t seen it before) was all over the place at the LC-39 observation gantry at the Kennedy Space Centre. This spot is a three-storey platform that allows you to get an elevated view of the key launch-facilities at Cape Kennedy: the gigantic Vehicular Assembly Building (VAB), for example, where they assembled the Saturn V rockets; and the 39A Launch pad, where they launched all the Apollo missions. All around the site were these grackles. In southern Ontario we have mostly common grackles; this is a different grackle, much bigger (the male), but just as noisy and aggressive. 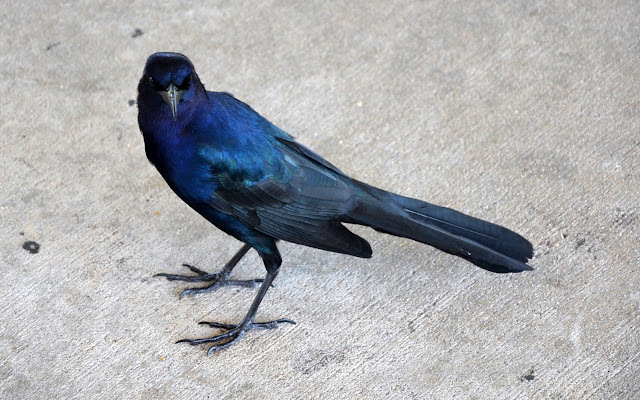 The grackles are icterids - very intelligent, pushy birds, that like to dominate their habitat. Icterids include blackbirds, cowbirds, meadowlarks and grackles. So - the dimorphism. The male boat-tailed grackle looks a lot bigger than the female. At 16-17 inches (41 cm), these are large perching birds. And like the very irridescent common grackle - which shines with a greenish hue - the boat-tailed grackle shines royal blue. Nice. The female has no irridescence, but it does show a pleasant blend of pastel browns and yellows. And it is a smaller bird. I thought they were two different species. They were both loud birds - but even more-so, the male. They seemed to be stealing and begging for human scraps – popcorn, bread, snack food, that kind of thing. Not very attractive. Not musical either. This bird emits mostly harsh whistles and clucks. 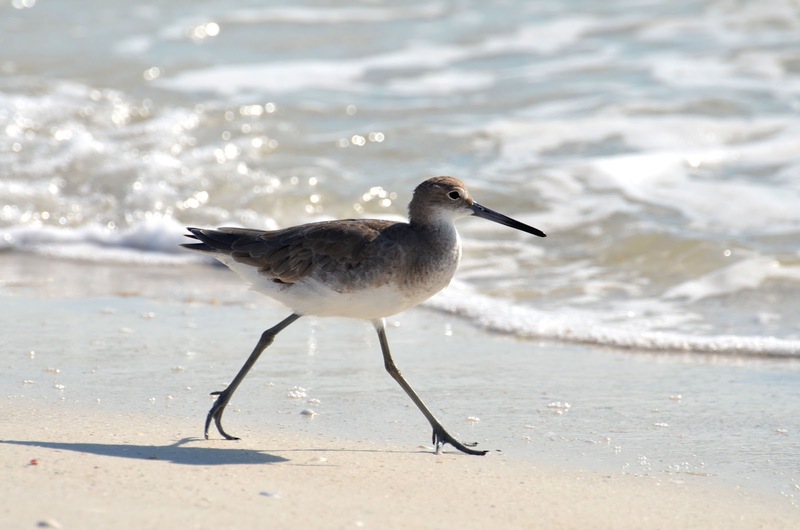 The next bird of note was found in a small flock on the beach when we first arrived at Jensen Beach, located on Hutchinson Island, hugging the Atlantic coast, just north of Fort Lauderdale – the Treasure Coast, it’s called. 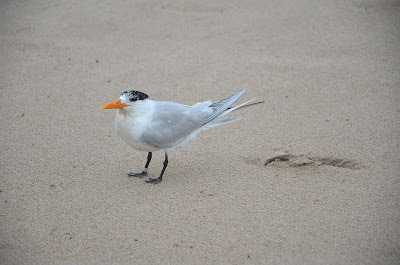 On our first reconnoitre of the beach, there was a flock of about a dozen Royal Terns (Sterna maxima). 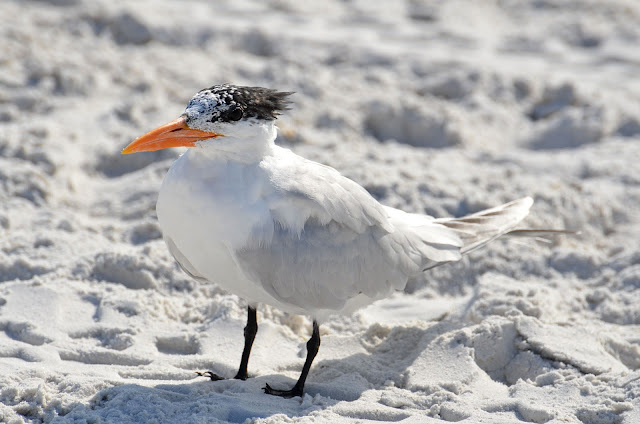 Terns look like gulls, but they are generally smaller and more streamlined (18-21”, 45-53 cm). Unlike gulls, terns do not land on water and swim about. They often hover over water and dive into it for fish. Compared to the terns found in southern Ontario, Royal Terns are closest in look and niche to the Caspian Tern. These Royal Terns were on Jensen Beach every day – standing as a small group close to the shore. They were not skittish at all; you could walk by them as close as a few feet. They would back up, or move sideways, but they wouldn’t fly off, unless you walked right up into their midst. A very attractive bird. A crowd of them standing around is very photogenic. I took lots of pictures of them - in groups, pairs, and individually. 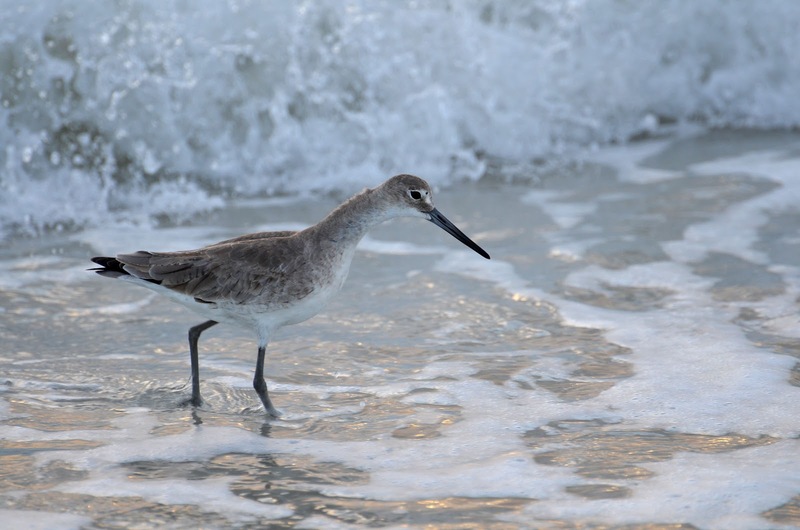 The Sanderling (Calidris alba) is a type of sandpiper – a small wading shorebird (about 7-8”, 18-20 cm). It’s found at beaches and mudflats. We saw this bird first at Jensen Beach, and found it again at Estero Beach. It was still in its winter plumage – pale, snowy-white underneath, and pale grey above with dark shoulders. It has a straight black beak, which is somewhat thicker than the smaller “peep” sandpiper. It is a wave-chaser – it runs up and down the beach like a clockwork-toy, following the retreating surf in order to feed within centimetres of the waves. 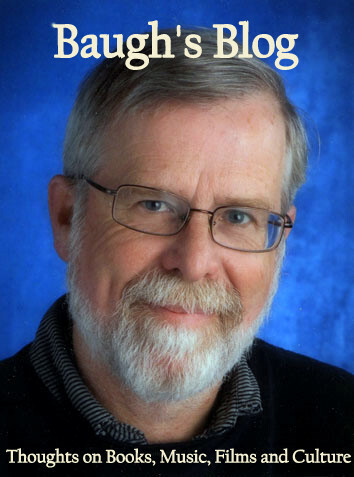 Usually seen in small groups. 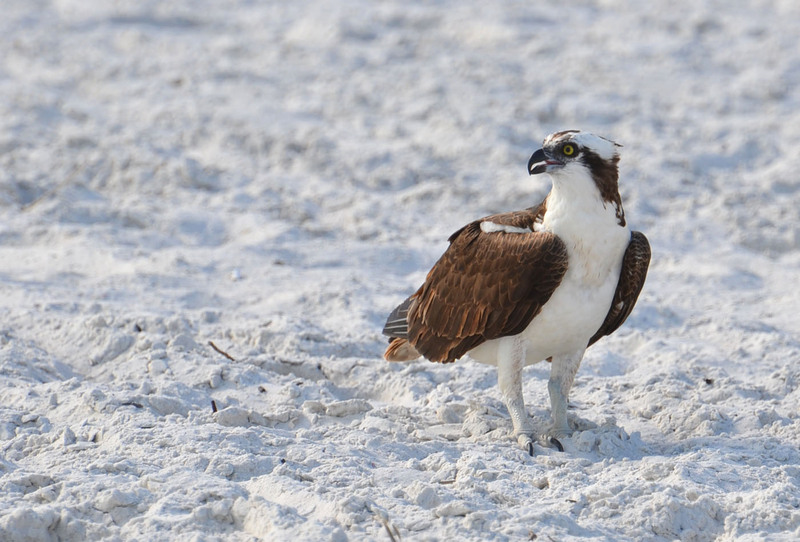 We saw the Osprey (Pandion haliaetus) everywhere we went in Florida. 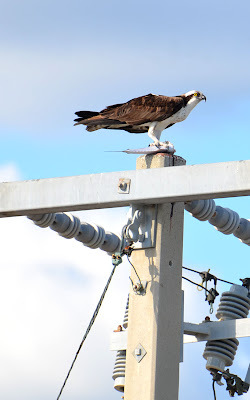 Like the Bald Eagle, it eats only fish; because we were next to water throughout our visit, we saw lots of Ospreys. They are raptors (birds of prey). The term raptor comes from its hunting technique - seizing prey with its sharp talons. Unlike Bald Eagles, which fly just above the surface of the water and scoop fish out of the water with their talons, the Osprey actually plunges into the water to seize the fish. 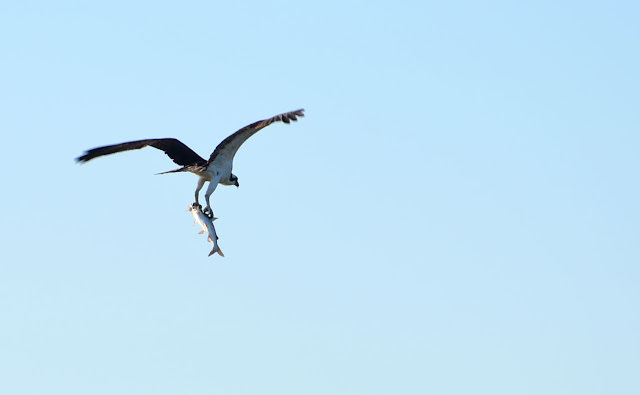 Then it carries it away to a high perch to feed, by pulling apart the fish with its beak. The Osprey is a medium-sized bird of prey (21-24”, 53-61 cm) – about the size of a buteo (buzzard). Smaller than a Bald Eagle, and its wings are longer and thinner. Ospreys build very large nests out of twigs and branches at the top of a bare tree. You will often see platforms attached to a high pole. This is done not only to assist the bird, but to keep it off of electricity poles, where the huge nests would disrupt the electric cables. Ospreys are easier to spot than many other birds of prey – they don’t soar as high and seem less skittish of human beings. The Willet (Catoptrophurus semipalmatus) is a medium-sized (14-17”, 35-43 cm) shorebird found, like many other shorebirds of its type, at beaches and mudflats. It's double the size of the Sanderling. We saw an individual bird on our first day at Estero Beach (on the Gulf of Mexico, below Fort Myers, and just north of Naples); after that, we found it in small groups there every day. You identify them from the combination of size, leg-coloring (bluish-grey), and beak (medium long, fairly thick, straight and dark). Even more distinctive - when it’s in flight - is the large, white, horizontal band running across the underside of the outstretched wing. It strolls the beach at the shoreline, looking for tiny invertebrates that are washed up by the incessant wave running up the strand. 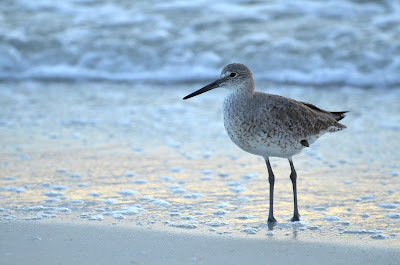 Its name comes from the cry: “Pill-will-willet.” I got some shots early in the morning, and at dusk, so there are some nice hues to the pictures. I love taking photos on a beach: pale sand, waves, birds, and people. Perfect. 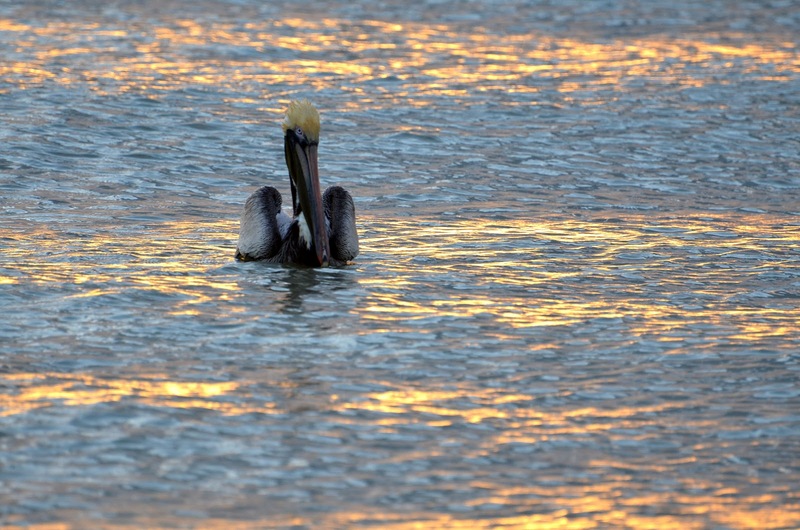 The Brown Pelican (Pelecanus occidentalis) is everywhere on the Florida coast. We saw it all the time – and at all times of the day. That allowed me to shoot it, like the Willet, in some very different lighting conditions, with some dramatic colour. Large water birds are a delight to photograph. They don’t flit around constantly, like sandpipers, or warblers – they move slowly and deliberately and strike majestic poses. Easy to follow, most of the time. A telephoto lens is best, to frame a large individual specimen against the pastel colours of sand and water. The Brown Pelican is a big bird (50”, 125 cm). It is generally a dark brownish bird - but it has lots of white (tinged with yellow) about the neck and head. The wings spread out to six-and-a-half feet. A pelican in flight is easy to recognise, and the way this species plunges into the water bill-first is distinctive. It was impressive to see a flock of six or seven of these birds on the estuary (during our boat ride around the Estero Bay) plunging into the water in tight formation - like a team of synchronized divers. I tried to get a good shot of that, but failed. Sometimes, you only get a few chances to shoot, and the technical demands are too great to handle within just a few seconds. 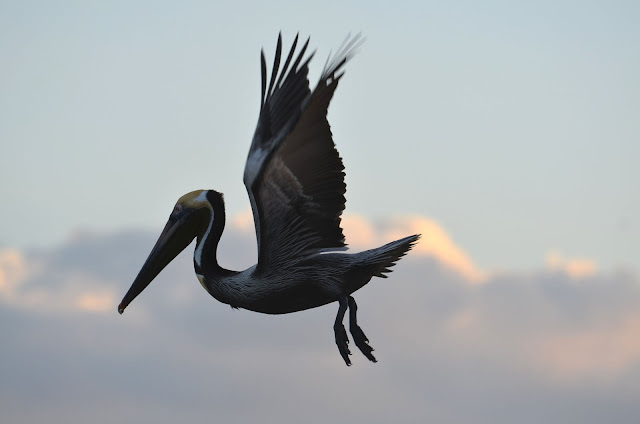 The best shots of pelicans are not when they’re on the water, but when they glide through the sky like a pterodactyl. They’re slow enough to allow successful pictures. Ugly birds in a way, but also very elegant. Herons and Egrets are amongst my favourite birds. Compared to tiny warblers, which flit about all the time, and never stand still for a moment, herons are slow, and, therefore, easier to photograph. We saw eight different species in Florida: the familiar Great Blue Heron and Black-Crowned Night Heron of southern Ontario, but also the Little Blue Heron and the Reddish Egret. And then there are three all-white egrets – the Great Egret, the Snowy Egret and the Cattle Egret. And the Tricoloured Heron. Herons are sleek, slow and deliberate. They pace about stealthily in shallow water, waiting patiently to spear an unlucky fish or amphibian with their long, sharp bill. One of the birding highlights of our trip was the visit to the Corkscrew Swamp Sanctuary, south-east of Fort Myers. We saw several large alligators, different frogs and lizards and lots of large wading birds. We got one close-up view of the familiar Great Blue Heron (found all over southern Ontario), but what a dramatic encounter it was! 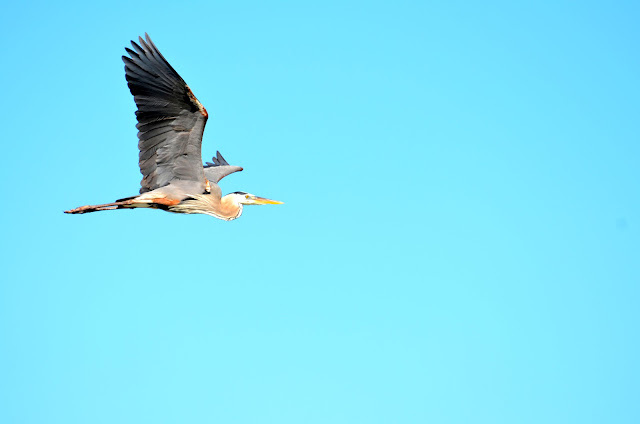 The Great Blue Heron (Ardea herodias) is a large heron (42-52”, 105-130 cm). It’s mostly a blue-grey colour, but there is lots of white around the head and neck. It has yellow feet and beak. It flies with a folded neck – with a distinctive wing-beat. Just beside us, off the boardwalk, a “GBH” (as birders call them) snatched up a huge frog, or toad, and devoured it in one gulp right in front of us. We could see the bulky shape of the large amphibian sliding down the inside of the bird’s neck – pressing up against the skin. Amazing! We got several close-up sightings of the Great Egret - both at the “Ding” Darling Wildlife Refuge on Sanibel Island, and at the Corkscrew Swamp Sanctuary, just south of Fort Meyers. It is a big heron – stretching to 38” (95 cm). Sometimes it stands erect, looking very slender, with the neck sticking out straight vertically; other times, when it’s feeding, it tips over, with its beak almost horizontal to the ground - readying itself to strike at a fish with its long, spear-like, yellow beak. We got a good look at one fishing at Corkscrew. It was standing very near a large, black alligator – but didn’t seem at all concerned by the giant reptile’s presence. The Great Egret’s plumage is completely white. Its legs and feet are both black – which is a good way to distinguish it from the similar Snowy Egret, which has black legs, but yellow feet. It flies with its long neck in a deep “sink trap” shape, with its long legs trailing behind. During the breeding season, it has long, filamentous plumes down its back. The Great Egret prefers freshwater habitats, mudflats and tidal shallows. The Snowy Egret (Egretta thula) is a similar-looking, all-white, heron-type bird, but it’s much smaller (20-27”, 50-68 cm) than the Great Egret, and its beak is dark. And, although the legs are black like the Great Egret, its feet are yellow. When it’s flying away from you, the yellow feet trailing behind are distinctive; and it has quicker wing beats than the Great Egret. 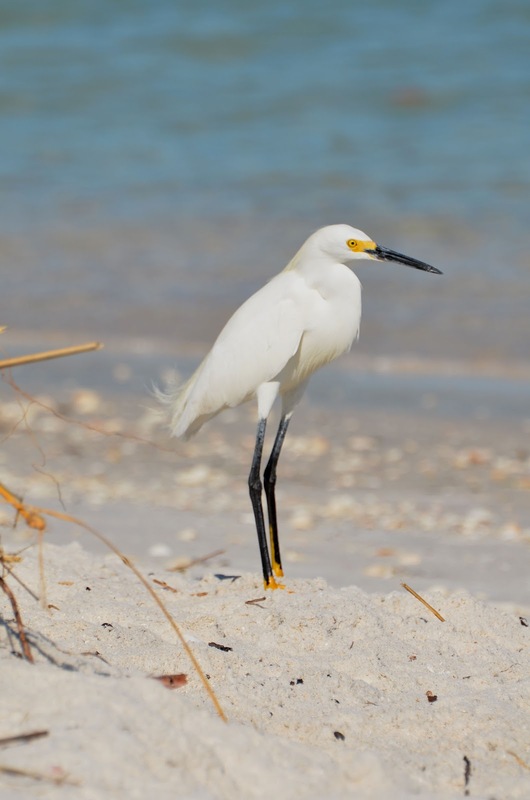 When it feeds, the Snowy Egret shuffles its feet, in order to stir up food. We saw it several times on the beaches of Estero Island. An exciting new addition to our birding “life list” was the Tricoloured Heron (Egretta tricolor). This bird was formerly known as the Louisiana Heron. It frequents the same habitats as the other herons – salt marshes, tidal shallows, mudflats, and freshwater marshes. The Tricoloured Heron is about the same size as a Snowy Egret. It is slimmer and longer than most other herons; and it wades into rather deep water to forage for food. The three colours that give this species its name: dark grey-blue upper parts and neck, a maroon or chestnut throat, and a white belly and rump. It also has an intermittent thin white line running down its throat. 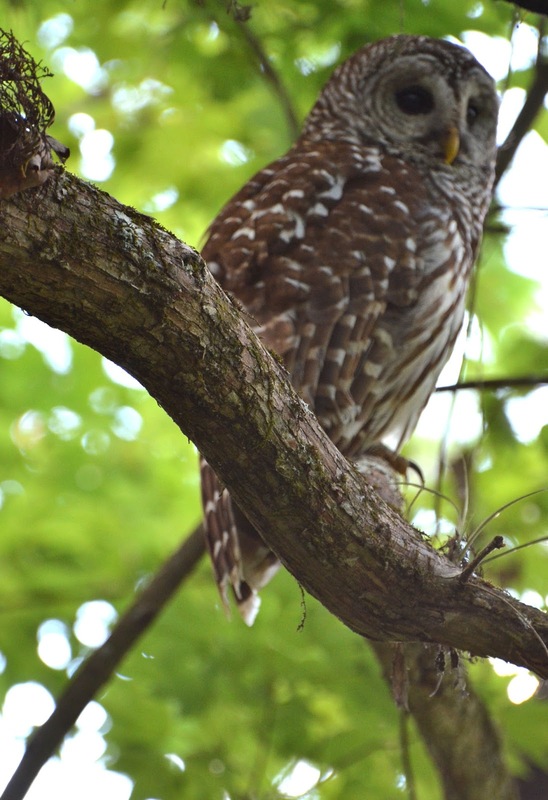 Our best siting of this bird was in the Corkscrew Swamp Sanctuary. The American Anhinga (Anhinga anhinga) is similar to a Cormorant. It is another new bird for our “life list”. It’s the same size as a Cormorant (34”, 85 cm), and is also a predominantly black bird – but it has very distinctive, large, silvery patches on the top of it its wings. It often holds its head and neck in an S shape. 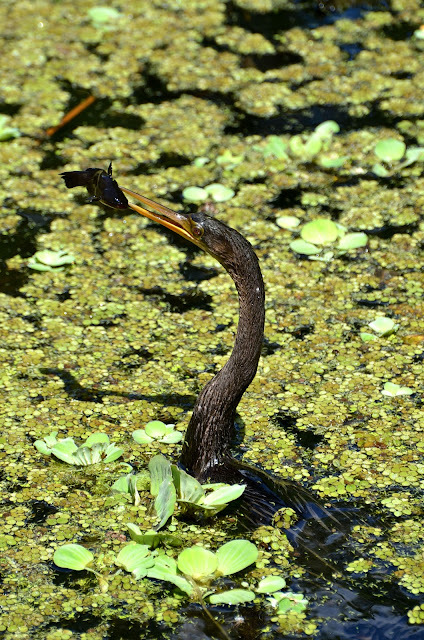 The anhinga’s beak is pointed – it doesn’t have the small hook on the end that the Cormorant has. And its neck is thin and snake-like. When this bird is hunting for fish it swims underwater. It will bring up a fish in its beak above the water, but only have its neck exposed – most of its body still submerged. After a session of fishing it will perch on a thick tree-branch and spread its wings – letting them dry off in the sun. 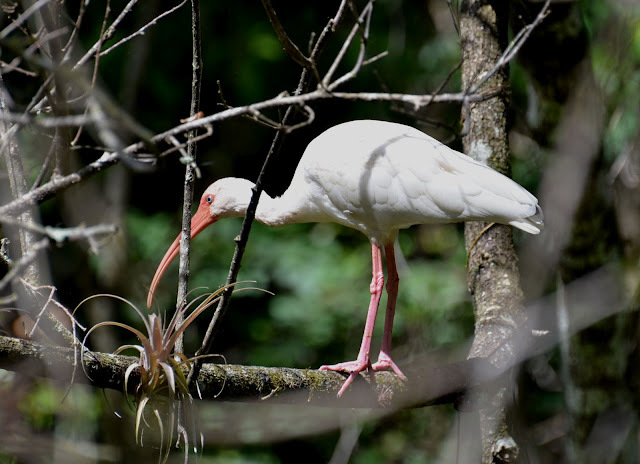 Another new bird for us is the White Ibis (Eudocimus albus). 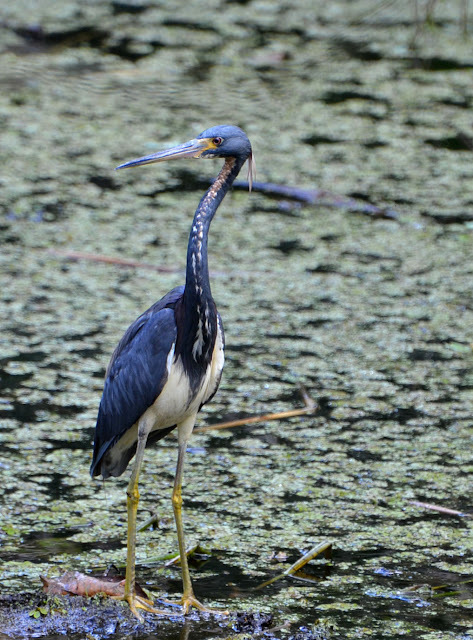 This is a long-legged, heron-like, wading bird. Apart from its slender, decurved, reddish bill, red patches around the eyes, and its reddish legs and feet, this bird is completely white. It’s about the size of a Cattle Egret (22-27”, 55-68 cm). In flight it shows black wing tips. 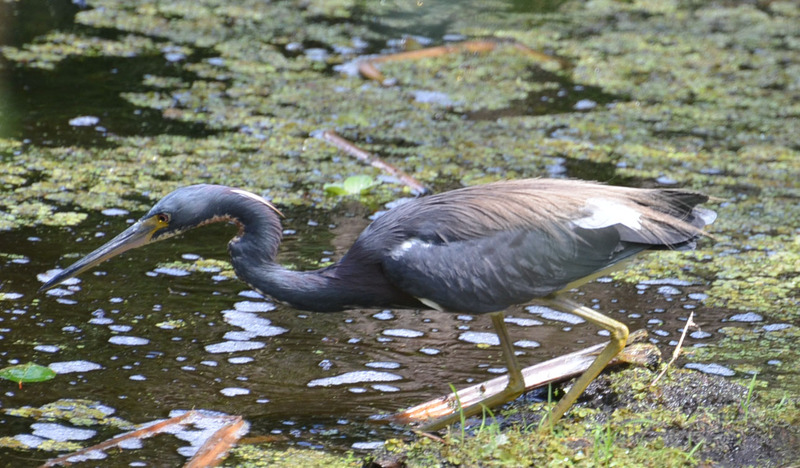 We saw this bird in the “Ding” Darling Wildlife Refuge on Sanibel Island and the Corkscrew Swamp Sanctuary. At Corkscrew, we saw a group of five or six of them at a fair distance. But then one individual flew over close to us, perching in amongst the branches and twigs of a small tree. 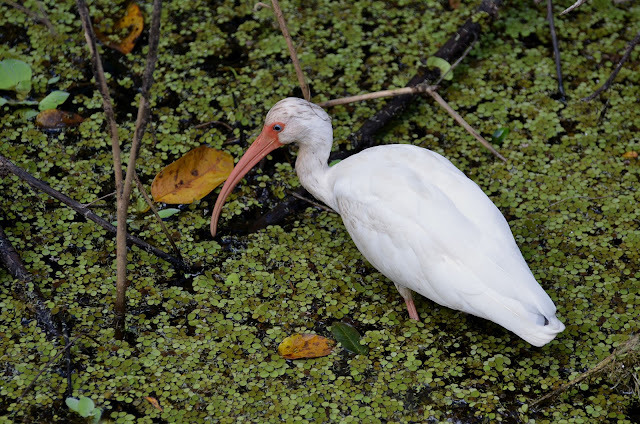 The foliage was interfering with the focusing of my telephoto zoom, so I was happy when this Ibis jumped down to feed in shallow water – allowing me to get some good, close-up shots. The final good bird sighting happened on our last day. There was a single Semipalmated Plover (Charadrius semipalmatus) on the mudflat beside a lagoon near our hotel on Estero Beach. Plovers are small wading birds (7”, 17 cm) about the size of a sparrow. They are more compactly built than the smaller sandpipers. 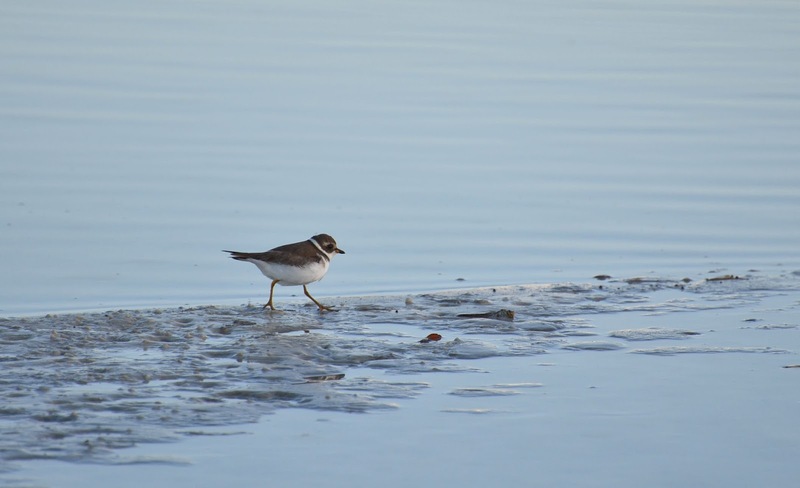 And the Semipalmated Plover is a small plover. Its colouration is similar to the Wilson’s Plover and the Killdeer, but it is smaller and the single dark band across its breast is thinner. The bill is a deep yellow, with a small black tip. And its legs are orange or yellow. It likes shores and tide-flats. Its foraging is of the look-run-look-peck variety. All of these photographs were taken with a Nikon D7000 camera using a Nikkor 70-300 mm telephoto zoom lens. Please do not copy or use these photographs without the permission of the photographer. Fantastic pictures Clive. Great notes and interesting observations. What a splendid post, Clive. I love to read excellent photos with explananatory text - it's a 'medium' that engages me. 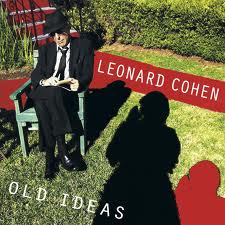 Like you, I have always (and still am) intrigued by birds - although I have not followed it up formally in any way. I see you enjoy your herons - although members of the heron family are much more limited here in the UK, we now see the Little Egret; I saw one in the river by me on my way to work last month. I was much taken with your shots of the raptors. We don't get many where I live in London - although a little kestrel drifts in from the local golf course occasionally and a sparrowhawk regularly terrrorises the garden blackbirds. I visited California a couple of times several years ago and was struck by the number and range of the birds of prey I observed in the countryside there. Unfortunately I had neither binoculars nor field guide - so I had to admire without naming! Again - great post. Looking forward to the next one.